Home / Travel / The hill tribe Flower HMong people at Bac Ha market, Vietnam. Hill tribe Flower HMong people at Bac Ha market, Vietnam. The hill tribe Flower HMong people gather every Sunday at Bac Ha market in Northern Vietnam. 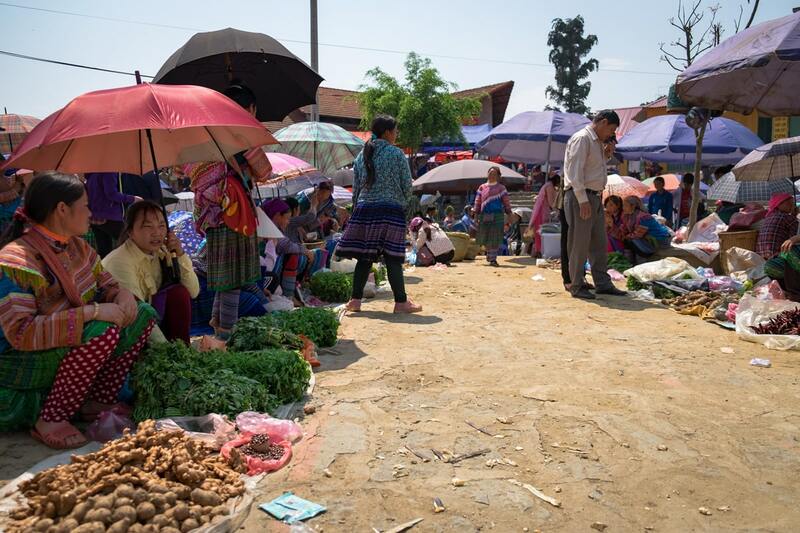 Bac Ha market is located in the northern hills of Vietnam near the town of Sapa (or Sa Pa) in Lao Cai Province. Visiting the hill tribe Flower HMong people is a great experience. The first thing you notice at Bac Ha market is the brightly contrasting colours of the Flower HMong ethnic group dresses. They come from their small hilly villages to this market for their weekly shopping. There is fresh grocery and fresh meat, handicrafts and clothes. The boys can get a haircut, children can get ice creams. I’is a routinely festive occasion, it’s their way of socializing. Men can also have a smoke with bamboo pipes at tobacco stalls. My favourite area of this market is where they sell buffaloes. At first, it was a surprise because, to be honest, I was expecting to see horses. A while back I did some research on Bac Ha market on the Internet and I saw a lot of photos of horses. Anyway, seeing all these buffaloes in one place was a delightful experience, though the smell wasn’t. 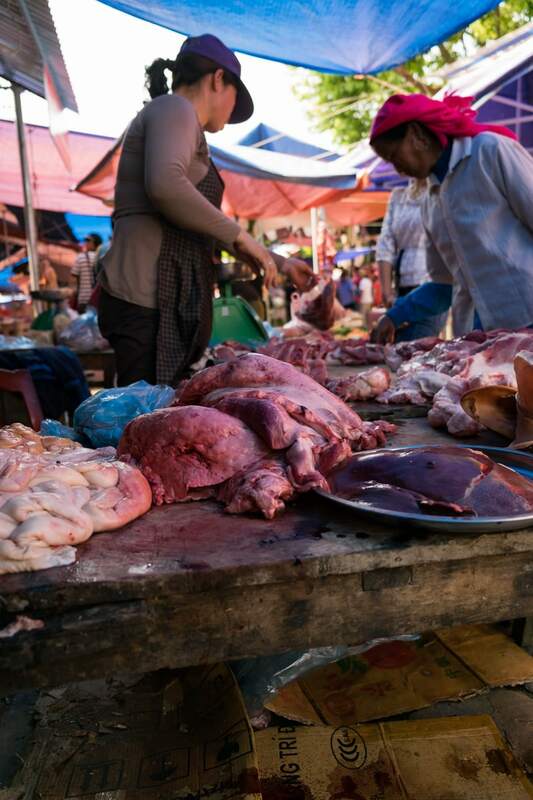 Another interesting and smelly encounter of Bac Ha is the meat market, which is not suitable for vegetarian people. : ) There is blood everywhere, a lot of it on the counters, stands, boards and on the floor. Bac Ha Market. Northern Vietnam. Vietnamese young men have their haircut done at one of the open-air barber stalls at Bac Ha market in Northern Vietnam. 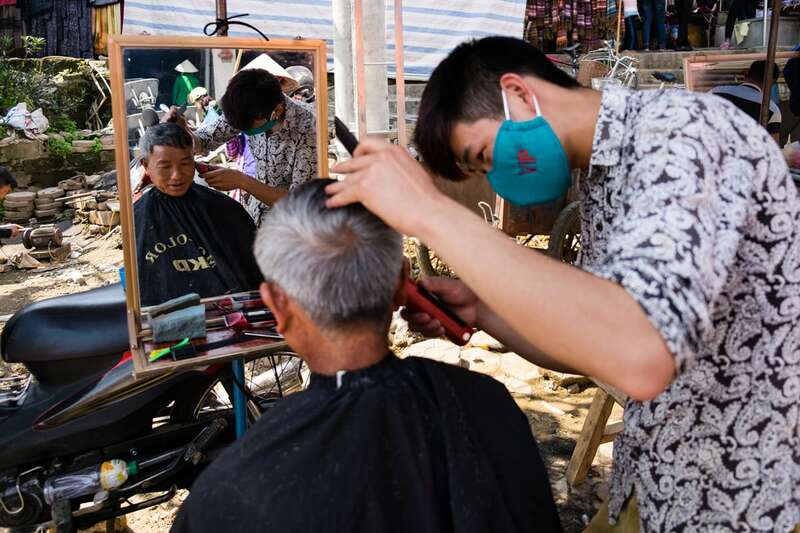 A Vietnamese man has his haircut done at one of the open-air barber stalls at Bac Ha market in Northern Vietnam. Hill tribe Flower H’Mong people sell brooms at Bac Ha market, Vietnam. A Vietnamese seller holds a dog on a leash ready to be sold at Bac Ha market in Vietnam. Vietnamese dog seller at Bac Ha Market in Northern Vietnam. Hill tribe Flower H’Mong women buy bamboo shoots at Bac Ha market, Vietnam. Umbrellas and hill tribe Flower H'Mong people at Bac Ha market. Vietnam. Vietnamese H'Mong women sell fruits and vegetables at Bac Ha Market in Northern Vietnam. Vietnamese Hill Tribe H'Mong woman and child with phone at Bac Ha Market in Northern Vietnam. Buffalo market at Bac Ha. Northern Vietnam. Hill tribe Flower H’Mong people sell handmade bags at the buffalo Bac Ha market, Vietnam. Hill tribe Flower H’Mong people at the buffalo Bac Ha market, Vietnam. Angry buffalo at Bac Ha market, Vietnam. Buffalo Bac Ha market, Vietnam. H'Mong woman sells Buffaloes at Bac Ha Market in Northern Vietnam. Vietnamese Hill Tribe H'Mong men have a rest at Bac Ha market. A Flower H'Mong woman speaks on the phone at Bac Ha market in Northern Vietnam. A Vietnamese Hill Tribe H'Mong man smokes tobacco in a bamboo pipe at Bac Ha market, Northern Vietnam. Vietnamese Hill Tribe H'Mong man at Bac Ha market sets a bamboo pipe with tobacco at a stall in Northern Vietnam. Hill tribe Flower H’Mong women chat at Bac Ha market, Vietnam. H'Mong people eat at Bac Ha Market. Fish market at Bac Ha in Northern Vietnam. Bac Ha meat market, Vietnam. Raw meat sold at Bac Ha meat market, Vietnam. Pig's or dog's head at the meat market at Bac Ha in Northern Vietnam. Vietnamese H'Mong women at their clothes stall in Bac Ha Market in Northern Vietnam. Vietnamese H'Mong woman at her clothes stall in Bac Ha Market in Northern Vietnam. If you happen to visit Northern Vietnam do go visit the hill tribe Flower HMong people at Bac Ha Market, I highly recommend it. Please check out my page on Vietnam. You may also want to visit my Travel page on this site to see more about other countries I have visited in Southeast Asia.